Let's forgo the "I'm sorry I've been missing" speech, because we all know that I have been. I've even been getting emails from people asking to take over Nailed It. Uh...no...I'm here, just busy. I have reviews and ideas cooking that I'm excited to publish soon, so content is coming, albeit more sporadically. On the docket tonight is actually a spring collection from Zoya, called Petals. It's a very feminine collection with colors you'd absolutely expect in a collection of that name. Pinks, purples and corals, plus a ton of shimmer and glitter. However, I do think that for a collection of six, for four of them to be a variation on pink or coral was a bit overkill. And I did have some trouble with one of the colors, but I'll get to that soon. First, the nail art! 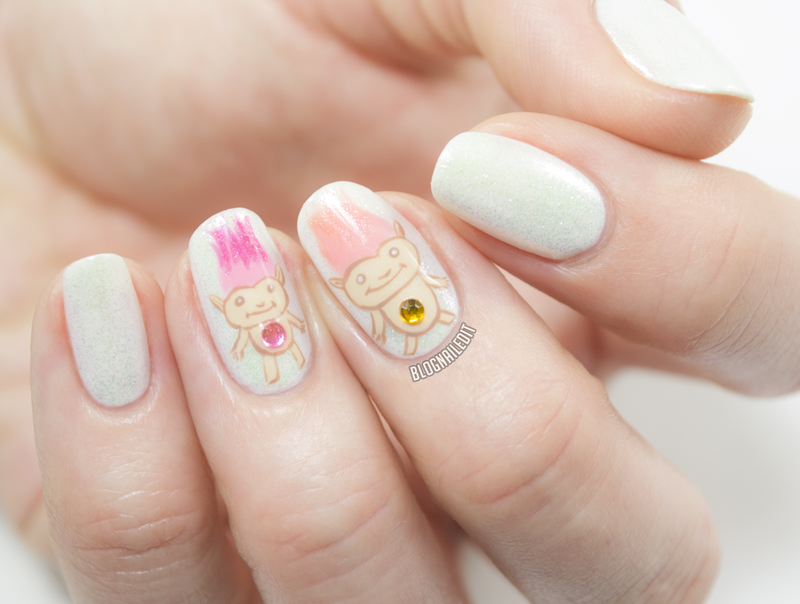 Don't ask me why I decided to do Troll Dolls on my nails. I came across a really random picture of someone's phone background that had these little guys, so I saved it, even though I don't know what the girl was talking about because it was in another language. I'm glad I did though. I can't help but smile looking at their spiffy ombrés and oversized belly buttons. I just don't have gems small enough for proper Troll-to-belly-button-ratio. In addition to colors from Petals, I used 3 other Zoya colors: Cho, and Spencer for their little bodies, and Genesis for the base of the background. Aster (2 thick coats) is the most unique color in Petals. It's a lavender jelly with iridescent angel dust shimmer. I needed thick coats, or would have done at least 3 thin ones to get full coverage. Azalea (2 thick coats) needed to be laid on thick too. It's a hot pink shimmer with an excess of sparkle. It's a 5-year old diva princess's dream polish. Laurel (2 coats) needed thickness as well, but I like the end result. It's a baby pink creme with just the slightest hint of rainbow shimmer. The sparkle is so small, it's even fainter than Northern Lights. Remember the color I mentioned I had a problem with earlier? Leia (2 coats) is it. As you can see, I didn't put any base down before Leia. 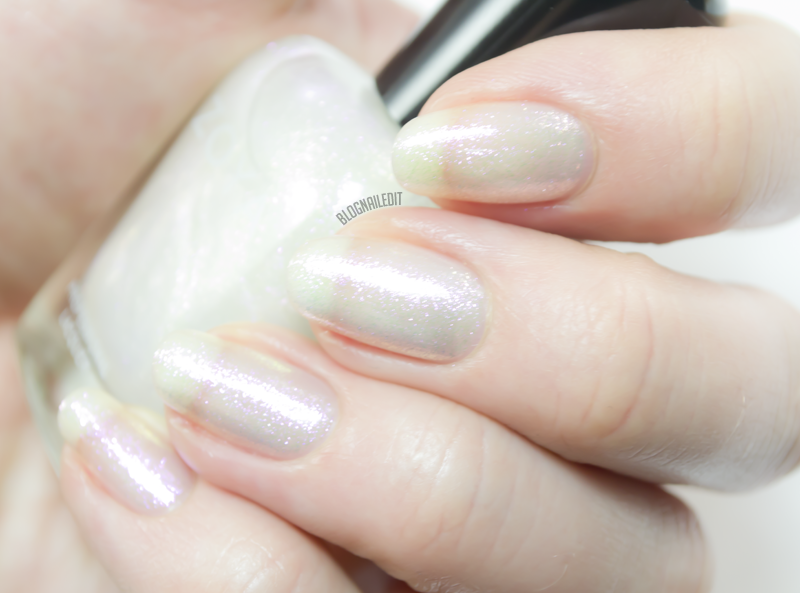 On its own, its iridescent shimmer is very yellowing, simply because that's the effect the shimmer creates. Now, layer it over another color, and you get less of the diseased drag queen look. That's why for the nail art, it went on top of another, more opaque white. I can't stand it on its own in any light! Clearly, it's a topper. Tulip (2 coats) has the same faint shimmer that Laurel has, but the color of the creme polish is more of a pale salmon. I don't think Zahara (2 coats) is built for long nails. This jelly is a peachy orange glitterfest, but it's quite sheer. I'd personally be upset if I got a mani and that much of my nail showed through. So if you buy it, build it up with more layers than I did here. Final thoughts on Petals are somewhat negative actually. The color variance is very ho-hum, and the formulas really bothered me. Some do make awesome transitions for Troll Doll hair though. If you are interested though, you can pick up Petals from Zoya here.